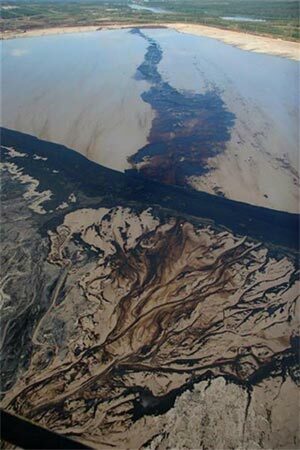 6 responses to "One hidden sign of an energy crisis (tar sands)"
I only read John B’s comments. Ryan’s came after I’d read the article. The impression I got was not that John disagreed with the need to make a transition to a more sustainable society, but that he believed that such a transition needed to be sold, by offering a relatively painless way forward instead of a hair shirt. As ever, we need a benign dictatorship. People will only ever vote for jam today. Hi Paul. The Hirsch Report suggested that a painless transition would only be possible if we began 20 years before the peak in global oil production. While he may well have over-estimated that timeline, I do think we’re beyond the point where a “relatively painless way forward” is possible. Which is not to say that the very worst predictions need to come to pass either; just that the longer we leave things, the more pain will be involved. I absolutely agree that representative democracy is currently holding us back. So long as people vote for charlatans who promise them a future that cannot possibly exist, we won’t deal with resource depletion before it deals with us. And it will do. It might be sensible, but it just won’t sell. Especially when the guy next to me is promising the return of the Celtic Tiger. The key question for me here – taking your starting point for this post of ignoring the parallel AGW crisis – is whether we have an energy crisis or an oil crisis. We definitely have an oil crisis; I’ve believed that since I started reading you on this years ago. But I’m less sure we have an energy crisis. There is still a hell of a lot of coal in the ground (a trillion tonnes, or 125 years supply at current rates), a lot of uranium (while nuclear power may be unsafe and uneconomic, it certainly can generate net energy), and – at least in warm countries – PV solar cells are approaching the point where they’re economically viable. The first two of these may well be undesirable from a CO2 and wider sustainability point of view (coal certainly is), but that isn’t the point we’re talking about. Much of the transport network as currently set up is impossible without oil, because it’s such a conveniently inert-but-energy-dense energy source – which is why tar sands, which are effectively a pollution-heavy way of converting other energy sources into oil, are being used, and why turning natural gas into LPG is increasingly popular. These are short-term fixes, which as you say will run out before very long. However, most uses of oil are substitutable in the medium term without major lifestyle changes. 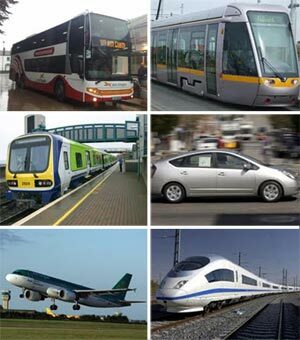 Electrified rail, in its various formats, is a substitute for cars, planes and buses. Electric cars are unlikely ever to work for long-distance travel, but work OK with current suburban commuter lifestyles. Ships can run on coal or nuclear (the E-class Maersk container ships are twice the tonnage of the US’s first batch of nuclear carriers). The only areas where oil is hard/impossible to substitute are rural transport and aviation. The latter is more a ‘loss of nice things’ than anything else – if non-essential aviation stopped tomorrow, we’d have fewer flowers and green beans in January and expat life would be sadder, but nothing would fundamentally be ruined. The former is more concerning, particularly in the US, given agribusiness’s reliance on oil-powered, mechanised kit. While biodiesel in general is uneconomic, it might work for rural & agricultural transport. NB I’m not saying a world with redoubled coal usage, nuclear ships everywhere, and food crops diverted to powering otherwise unsustainable agricultural systems is *desirable*: rather, that I don’t believe energy constraints alone are going to force the world into a CO2-sustainable future. John, it’s worth pointing out that I “don’t believe energy constraints alone are going to force the world into a CO2-sustainable future” either. Far from it. I think it’s almost guaranteed that policy-makers will attempt to mitigate peak oil with a return to coal, a ramping up of nuclear, an increase in biofuel production and – if we’re lucky – some additional investment in renewables. However, I believe this will ultimately be disastrous and won’t provide a long-term solution to the problem. We’ll have an oil crisis. We’ll react to it with deforestation, coal, nukes and biofuels which will briefly plug the energy gap but create a series of other crises. And then as oil continues to decline, those strategies will cease to plug the gap and we’ll have a full-blown energy crisis. I think we have two basic disagreements. Firstly about the primary importance of oil. Secondly about the amount of time it will take to switch away from oil. I don’t believe that coal, nukes, biofuels and renewables are – in practical terms – capable of adequately replacing oil. And I certainly don’t think that even if they were capable, that we could get them on-stream in time to prevent the collapse of the very infrastructure that will allow them to be built. Obviously the detail of the arguments that I feel support those assertions would consist of a long and dull series of blog posts rather than a single comment here. And while I’m quite busy with work for the next couple of weeks, that long and dull series may well appear here before too long. For now though, let me just say that I (genuinely) hope you’re right and I’m wrong. Statistically speaking I still have half of my life to live and I quite like my unsustainable standard of living. I’d be a liar if I said otherwise. I feel that our strategy for dealing with peak oil will cause massive damage to the biosphere, but that’s going to happen whether or not peak oil causes the sort of total collapse I envision. So, if it’s a choice between the two, I’d prefer the non-collapse option. I just don’t think it’s very likely. Well Jim, I’m honoured to have prompted a whole blog post from you! I’m tempted to write a response disagreeing with you as much as possible, entirely because your repeated use of “massive quantities of tar sands” in quotes seems a bit more ironic than is warranted. Canada now being the second biggest supplier of oil in the world and all, ‘massive’ seems appropriate. For example I could point out that the USA may well not mind about Canada providing it with less natural gas, because of the, ahem, massive quantities of shale gas the USA is producing right now. 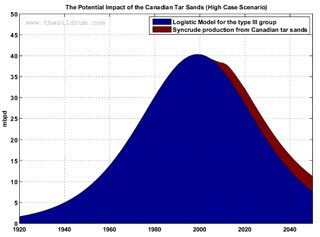 But basically I take on board your argument that there are problems with tar sands production which mean it’s unlikely to fill the gap between supply and demand presented by peak oil, and I appreciate your response. And OK, it was rash of me to say I don’t see any signs of an energy crisis. Tar sands, shale gas etc are all symptomatic of a real and current energy crisis… I do think that as conventional resources diminish and prices rise, the tendency for new sources of oil and gas that were too expensive to get at before to seem ‘economically viable’ looks likely to make this crisis more drawn out, messy and unpredictable than I think the peak oil proponents initially expected. Hey Ryan. My use of the quotes around “massive quantities” was partly just a literal indication that I was quoting you, but I concede that it was also partly to reinforce the notion that although there are massive quantities there; they are at least partly an illusion. Firstly because those vast resources can only be exploited at a relatively restricted rate, a rate that is absolutely dwarfed by global oil consumption. And partly because the oil we get from them cannot be compared like-for-like with conventional crude thanks to the vastly inferior net energy. Right now we’re getting between 1.5 and 2 mb/d from the Canadian sands. A small drop in the 90 mb/d we’re consuming. However, if we factor in the knowledge that each barrel from the tar sands has a net energy equivalent of 1/8th of a barrel from Saudi or the North Sea, that number looks even more minuscule as a battle against a looming energy shortage. With regards to Shale Gas, I’ve yet to do much serious research on the subject. Some people believe that increased gas production (from whatever source) can offset decreased oil production, but I’m not one of those people. I feel the unique importance of oil to modern society is seriously underestimated. That said, I do know a couple of people who have spent a lot of time studying shale gas (mostly from an environmental angle, but they also know their stuff from an engineering perspective) and while the promise it offers isn’t quite as hollow as tar sands, they seem to think it’s being hyped way beyond any real potential by an industry desperate for investors. It’s something I do intend to look into in more depth soon though. One thing we do know about shale gas, however, is just how ecologically catastrophic it has the potential to be. Of course that won’t stop us exploiting it if there’s money to be made. And yes, it may offset some of the fall in oil production within certain sectors of the economy (i.e. as you point out, allowing Canada to continue burning natural gas to hydroprocess tar sands); but shale gas as a mitigation strategy for a peak in conventional oil is seriously flawed. As for the crisis being “more drawn out, messy and unpredictable than […] the peak oil proponents initially expected”, it’s probably worth pointing out that peak oil proponents have always said this would be a drawn out, messy and unpredictable process. Hence Kunstler’s book being called “The Long Emergency” and CJ Campbell talking about a “20 year plateau”. I’m actually at the more ‘dramatic’ end of the peak oil community in that I believe the implications of peak oil will eventually sink into popular mass consciousness and provoke extreme reactions leading to a crash. But despite the mainstream media portraying peak oil proponents as predicting the sky’s about to fall and one day we’ll wake up and find nothing works any more, in reality these guys tend to be a bunch of middle-aged and retired engineers and academics whose pronouncements are far too dry and measured to make it into the media without being sexed-up almost beyond recognition.